In today’s world there are literally hundreds, if not thousands of different chefs knives, tools, gadgets, and equipment that are available to the home cook. 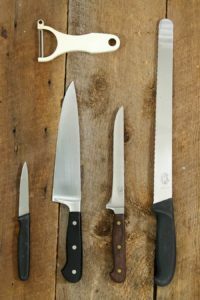 It can be quite overwhelming when first trying to properly outfit your kitchen, so in this guide I’ll go over the different types of kitchen knives available, which ones you should own, and what some of the best chefs knives are you can purchase. When first looking to purchase knives, either to outfit your home kitchen, or as a budding chef preparing for culinary school, it’s important to know the different types of chefs knives available to you, and what they are used for. Depending on what you regularly cook, if you are attending a culinary school, or are just a food enthusiast, you may need all of them, or just a few. All of these knife shapes serve a specific purpose, and are designed to make certain tasks easier to perform and the cooking process more enjoyable. As mentioned above, if you are simply outfitting a home kitchen, you may not need all of these. Read on to find out what they are used for, and then decide which knives fit your cooking style the best. I’ve included my ‘Chefs Picks‘ for the various styles of knives. Some of these I own, and a few I have used and wish I owned! They are all professional, high quality chefs knives, favored by Chefs and cook in the cooking Industry. If you are looking for something a little more economical and not as high-end, I would suggest looking into Grohmann Knives, a Canadian company that offers very good quality knives, at an affordable price. The French, or Chefs Knife as it is most often called, is the jack of all trades in the kitchen. 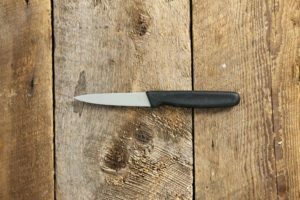 It can perform virtually any task you put before it, and if you can choose only one knife of this list, a Chefs Knife is the one to get. 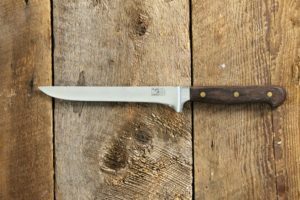 Most often used for chopping, slicing, and mincing, the chefs knife features a rigid blade 8″ – 14″ (20cm-35cm) long, with a broad heel that tapers to a point. The slightly curved blade allows for easy chopping, and mincing as the knife rocks back and forth. Shorter chefs knives tend to be lighter and easier to use for those with small hands, while the longer bladed chefs knives are a little heavier, but make slicing easier. 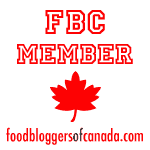 – a high quality, durable chefs knife that will last you a lifetime if properly cared for. Utility knives are just that. An all purpose knife meant for various tasks that don’t require as heavy or sturdy a blade as the chefs knife. Ideal for cutting fruits, soft vegetables, delicate meats, and more, the utility knife features a slightly shorter blade then a chefs knife (between 6″- 8″) and is narrower over all. Chefs Pick : Wusthof Ikon 6″ Utility Knife – featuring a handcrafted African Grenadill wood handle, this full tang knife features Wusthof’s iconic durable steel blade with a rustic looking riveted handle. Designed to separate meat from bones, the boning or fillet knives are most often used to butcher poultry, and clean various secondary cuts of meat. Boning knives are Ideal for cutting through small bone joints, and can easily strip meat from bones without leaving any waste behind. Fillet knives are usually a little bit longer and thinner then a boning knife, with a flexible blade meant to clean fish. With a thin and semi-flexible blade, 5″ – 7″ in length, the boning knife can come in various blade shapes depending on the brand of knife. Because boning knives are generally fitted with a flexible blade, they are not normally used to portion or cut meat itself as the flexible blade wont produce straight, precise cuts. Once the meat is separated off the bone, a chefs or utility knife should be used to portion the meat itself. Chefs Pick: Global 6″ Flexible Fillet Knife – Designed to fillet fish and clean chicken, this light, easy to handle boning knife features a seamless design to ensure easy cleaning. A paring knife is a short rigid knife with a blade 2″ – 4″ inches in length. Ideal for precision work, pairing knives are most often used to cut vegetables, small fruits, and to prepare garnishes. They are great for peeling vegetables when lacking a peeler, and are great for cutting open pomegranates. Paring knives may have differently shaped blades (such as a birds beak), to make cutting curved surfaces or turning vegetables easier. Chefs Pick: Shun Classic 4″ Paring Knife – A light yet comfortable paring knife with a high-carbon stainless steel forged blade featuring a Damascus look. Razor sharp, this paring knife won’t let you down. A cleaver is used in butchery to chop or cut through large bones. With a heavy, large rectangular blade, cleavers are not as popular as they used to be since most meat sold in grocery stores is already broken down into secondary cuts. An old chefs knife is often used by cooks to cut through small bones, and open lobsters instead of carrying a heavy cleaver. Chefs Pick: Shun Classic 6″ Meat Cleaver– Perfect for cutting through bones, sinew, or hard vegetables such as squash. Used to slice cooked meat and raw or cured fish, a flexible slicer is king when it comes to precise, thin cuts. With a long ( 10″- 14″ ) blade, slicers may be flexible or rigid and can come in rounded or pointed ends. They are perfect for carving turkey, slicing roast beef or ham, and cutting sashimi, or sushi. Chefs Pick: Global 10 1/2″ Flexible Slicer – A long, flexible, and extremely sharp blade ideal for slicing salmon, ham, or any other meat. Serrated slicers, (also called bread knives) are most commonly used to cut breads and baked goods. With a blade 8″ – 12″ in length, serrated slicers make a great multipurpose knife for any home cook. With their sharp ‘teeth’, serrated slicers shine when used in a sawing motion to cut through delicate baked goods without crushing them, such as sandwich bread. Chefs Pick: Wusthof Classic 10″ Serrated Slicer – With a long serrated blade, this slicer is ideal for cutting roasts, as well as any size of bread! A specialist knife not seen very often in stores these days, butchers knives are used to cut primary cuts of meat off of butchered animals. They can also be used to break primary cuts of meat down into secondary cuts. 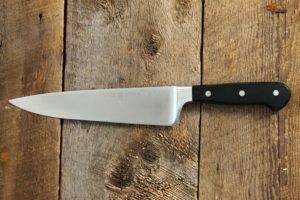 Boasting a large scimitar style blade the average cook, would forgo a butchers knife instead of a chefs knife, as a chefs knife can accomplish most of what a butchers knife can with a little extra work. 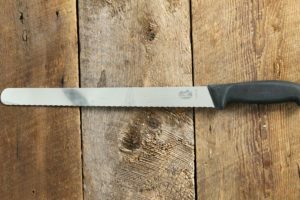 Chefs Pick: Victorianox 10″ Butcher Knife – With a large high-carbon stainless steel blade, this butchers knife can easily handle even the largest roasts and cuts of meat. Another (but more common) specialty knife, clam and oysters knives are used to open oyster and clam shells. Both feature short rigid blades, a sharp point, and a sturdy handle, though generally only the clam knife will have a sharp edge. Chefs Pick: Chesapeake Bay Oyster Shucking Knife – Featuring a large round handle and short blade for good leverage, this oyster knife is equipped with a small guard to protect your fingers should the knife slip. What Are The Most Important Knives To Have? 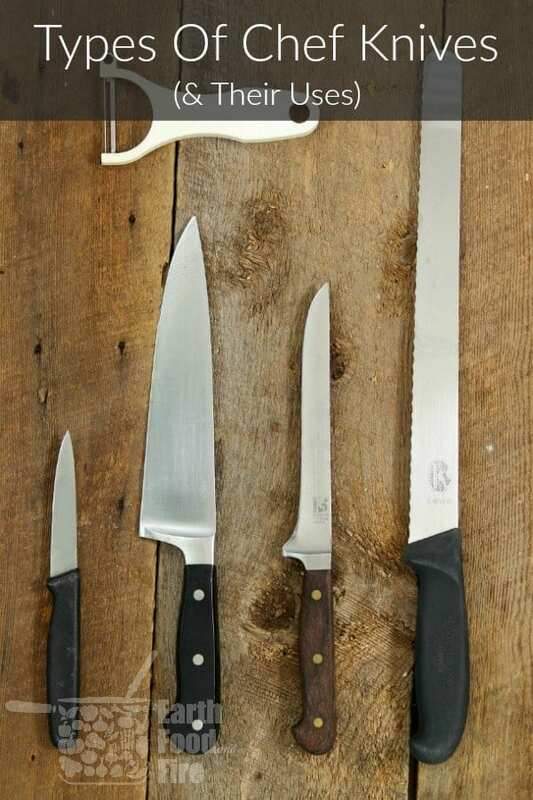 These three knives will handle any task thrown your way in a kitchen. All other types of kitchen knives are helpful, and can make certain tasks easier, but are not essential. The average home cook will do just fine owning a good quality set of these three knives. Quality of the knives is more important then the quantity and variety of knives in your kitchen. If you are attending a Culinary School, it is important to equip yourself with all the above styles of knives in order to properly learn how to use them correctly, and practice your knife skills. 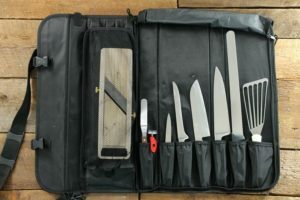 Make sure once you have your knife collection complete to store them in a knife roll to keep them clean and in good condition! Awesome & brilliant. Really love your idea as I’m great full to you. Thanks a lot. Keep this up. What a fantastic guide! I definitely need to up my knife game! Such a great article! Thank you for the refresher but I also learnt! Pinning also! Thanks! I hope it helps you pick a good knife for your kitchen! So thorough and so helpful! Great details on what each knife is best used for. Definitely bookmarking this for use later! Such an informative post! Learned a lot! So informative. I didn’t know clam and oyster knives existed! But regardless, a good knife is essential in the kitchen! Thanks so much for the insight on this many people think we use only one type of tool for cooking, but we do use a variety of different things especially knives. This is so informative and helpful! Thanks for sharing!